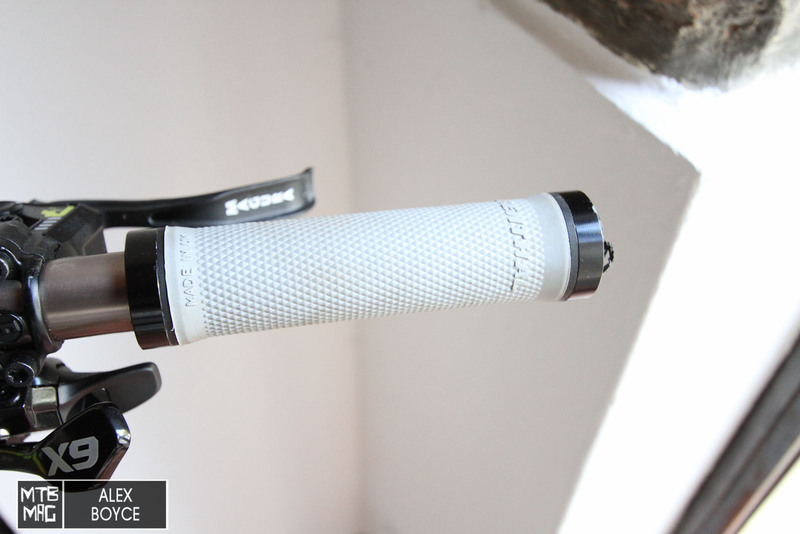 With Renthal coming from a motorbike back ground and a solid focus on control items and power, when they started producing their mountain bike components, grips were one of the obvious things that they would be looking at. After our recent trip to their production facility in the UK we left with a few items to test. One of these items were their lock on grips. We managed though not to just leave with one pair of grips but a variation with different grip hardnesses that give a good way of seeing how varying compounds can be important in a component and also where the high level thinking that comes from Renthal engineers can lead to better consumer choice. The two grip compounds we tested, soft (left) and super comfort (right). Weighing in at only 116 grams the main features of a grip are obviously the surfaces that come into contact with a riders hand and the locking mechanism. In this case there are four different grip compounds each of a different consistency. We have been trying the soft and the super comfort compounds. We have tried a while back the medium as well. As the diagram below shows it is possible to see that each compound has a different characteristic and benefit/loss. Our test focused on how the compounds we tried fed back into real world bike handling. The rest of the hardware of the grips follows a standard set across the industry with two retention bolts recessed in the collars. Where Renthal differentiates is that the outer collar has a incorporated end cap that negates the need for a plastic bung in the end of the handle. 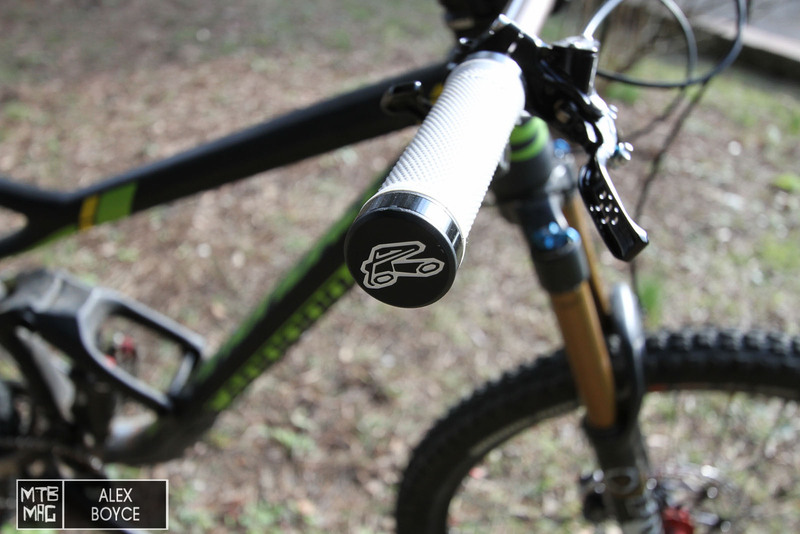 We like this design feature as it means the bar end is better protected. We saw this when after one particularity heavy fall we hit the bar into the ground, rather than the bar breaking the end-cap took the force of the blow, leaving the bar completely unscathed underneath. With the simple plastic plug solution we found previously that the bar would have also been damaged somewhat. 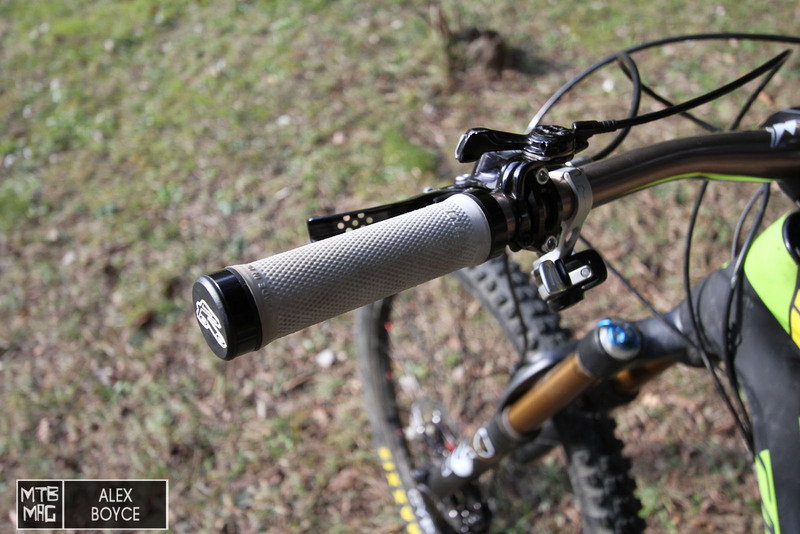 Add in the aesthetic look of the grip and it seems Renthal made a good design choice with this system. Soft grips with end cap that gave good protection for bar knocks. Super comfort, white compound which we prefer due to the comfort factor. Trying the two compounds back to back on our test trails in Punta Ala, we found that the varying compound choices allowed us as a rider to be used to a similar grip form and diameter but at the same time we were able to judge which grip felt better for different situations. 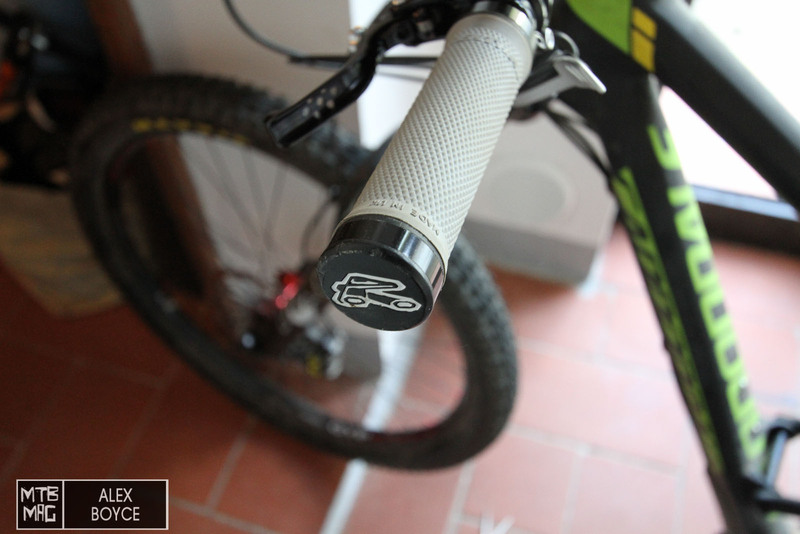 Firstly we noticed the harder grip lasted longer, as noted by Renthal, but we were not disappointed by the softer grip performance regarding longevity which was a fair compromise. Actually riding we preferred the softer grip as the vibrations back through the bar and the greater tackiness meant we could react with slightly more control for our riding style than with the harder compound. On rough trails like Rock-Oh the harder grips felt good, but fatigue was reduced with the softer compound form. The harder grips for us became the more obvious choice when our riding style switched to longer more gentle trails, where the extra vibration absorption was not needed. In this case yes we can say our grip on the bars felt slightly more direct and with more control. Grip surface was good for all our riding conditions. We found that with gloves or without we did not slip. The built in end-caps are great, look good and should be expected from a high end grip. We did not think that compound would be that important a feature when it came to the same grip form, however from our testing we decided that Renthal have hit the nail on the head when it comes to choice. 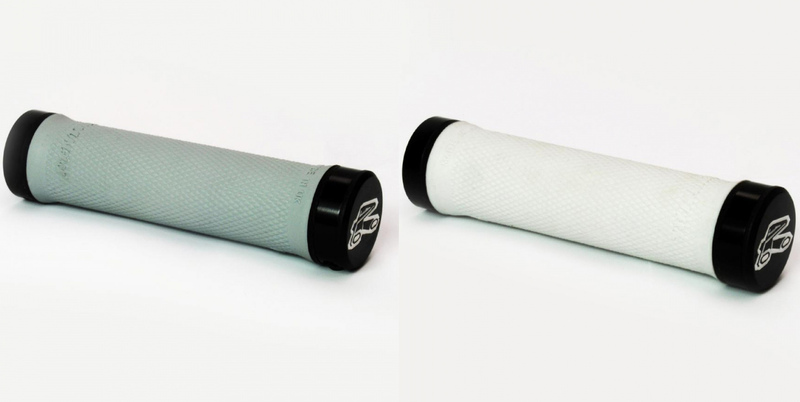 Not all riders are going to appreciate the same grip hardness. This is a very personal thing and honestly different riding styles require different needs. We also think that carbon bars with their greater micro vibration absorption can be used with a slightly firmer grip compound, but we would need more time on these combinations to see if it really matters. All in all our contact points are important and if as a rider you are lost in which choice to go for, we would say start with the soft lock on and either go up or down according to your experience. 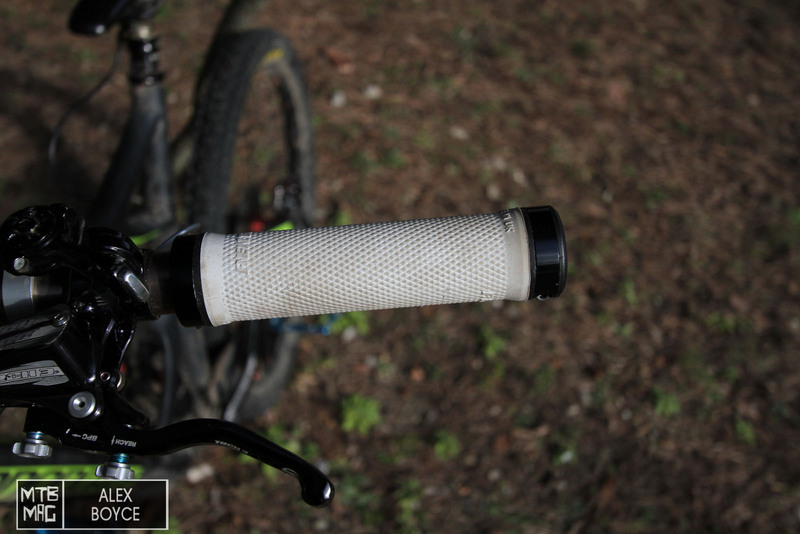 Grips are more of a disposable item that need replacing depending on the amount of riding one does. It is not easy to find the perfect grip, but with what we found with the Renthal choices on offer were that with their ideal surface texture that worked in a range of weather conditions and choice of compound it is a good solid grip that is durable to consider when trying to tune your ride. This is where the end cap did its job.